More features in development, and steam greenlight! I've been steadily fixing up the usability of the game to have a tutorial level (on the first planet) As well as taking feedback from people who have tested the game. So far I have a pretty good list of requests that I'll be working on within the next month. As for an update, I may post a newer version with some of these features and cleanups once I feel ready to ask for more feedback on the web. I'm trying really hard to finish Generantis, so please wait patiently as I get closer to promoting the game further into development and improving the game based on feedback. My dream is to have this be a finished game that I'm proud of, so I won't stop listening to friends and followers, because I am highly determined to contribute to indie gaming. Cya folks! The demo of alpha 1.3 is released on itch.io! a video will be posted shortly, to go on the media page! Have fun! I personally said I'd be taking a little break from the game this winter break, but I couldn't resist. So after a couple weeks of development, I'm letting you all know that development is seeing some good progress! With my last semester in a week however, I'm going to be very busy, so it's good I got this much done for now. Seeing how there has been 2 other progress videos of pure gameplay up on youtube, I wanted to keep the streak going, so I should have another one up for January's progress video within the next week! I know that December didn't see a video, but I was kinda busy with other things as I finished up the fall semester (and other personal things like getting an internship). Shadow Bosses (formally known as Rogues): Tough bosses that spawn as copies of whatever character made the planet that the boss is now guarding. They can be located by looking at the HUD in the upper right corner of the screen, but they are recommended to be fought later on when the player gains strength. Planet quests are removed, and replaced with having all quests spawn naturally and activate automatically when the player is within a screen's distance. Completing a quest will spawn a Ghost, which is basically a character in the game that died on a run. All enemies don't drop themselves anymore, it was too much junk on the screen just to have the added ability to take along a monster you killed. Creating a new character will make him mortal, with permadeath. You start on Generantis, and by killing a shadow boss you can enter the next planet in-game by clicking the dead boss. When reaching a dead-end planet, a boss called "Ascend" will spawn, and defeating him will allow you to ascend to immortality. When ascending, you can now Create Legendaries! Select ANY item you have, even another Legendary, and name it along with having flavor text. Legendary items drop in game, and when they drop they have an extra component added on, of ANY type from the item category. So you could have a legendary gun that slices enemies or a desert map that has ice caves. Every legendary item that drops again starts at level 1, and making that legendary into another new legendary will spawn somewhere in the game as a level 2 with the level 1 component intact, but with yet another random component! Max components is 9, but legendaries have unlimited levels so you could potentially roll upgraded weapons with more and more weapon attack each time! 2d Lighting!! The original skybox is back and better than ever. When the sun goes down, it gets dark out, and currently projectiles and your character emits light (even colored light). Going underground also makes it super scary and dark! Placing items in the generator now requires the proposed item to be a direct descendant of another item in the generator, unless it's a root item. This means you can't just put a godly tier item in the generator at the first few planets you spawn off generantis (due to game mechanics you should be able to put legendaries in if they have a matching base item tier, this is in the works for now). In game guides that trigger and popup during certain kinds of gameplay in order to help you understand the game better. These can be permanently toggled with the T key. A bunch of bug fixes and lots of fixing with the game's character saving. Some creative mechanics for the game have been planned in order to not only give the game a better progression and objective system, but also to allow the game to play more traditionally in order to make things easier to comprehend when just starting out in the Gigaverse. First I'll explain what type of game Generantis is trying to accomplish, then I'll prove how that will happen. Generantis is a game that dynamically changes. You are given lots of planets all connected in branches starting from Generantis, the center planet. These planets are the environments that give the player challenges to complete in order to advance to the ends of the universe, exploring to find more out there in the Gigaverse. The game tries to achieve this dynamic gameplay and content by having support for the player to create their own planets with the loot they found in the previous ones, with new items unlocking as they farm them. These planets add on to the previous, giving the core game more content to explore and adventure through. But... this also adds a challenge to the player, because they have to travel to the ends of the planets in order to create planets of their own. Which brings us to how this will work and why I think it's best for the game. The game will have 3 phases. The first phase happens when you create a character. These are called adventures. Every character you create will have permadeath, with the starting zone being Generantis. As they explore, they will find bosses guarding the next possible planets to travel to, each boss character being a mischievous clone of the character that made that planet being guarded. These are called Rogues, and won't be in the game until later when they are ready. When exploring these planets, other characters who have been played on these planets before are saved in the planet's data, found on different areas of the planet, with objectives they give you if you want them to join you. By completing mini objectives with the quest items littered around the planet, you eventually build up power, until you feel you are able to defeat one of the Rogues guarding their planet. The objective of this adventure is to reach the ends of the planets, in order to achieve immortality, removing your permadeath and awarding you the power to create planets with items you find from anywhere you wish to go. This is where the next phase happens: Farming. Farming isn't quite as important as the other 2 phases, but it also isn't pointless. You want to build the adventure you wish to play on during your experiences in Generantis, so go ahead and find items of all types to put into your new planets! Minion planets with lots of little creatures of different types, all converted to minions by mystic enemy rivals for epic Minion vs. Minion battles against your own little army. A Vault planet with lots and lots of loot, with the most loot of all guarded by the strongest bosses. Themed planets like wild west deserts with revolvers. Those are some of the potential "builds" of planets you could create by either finding the items and crafting planets with them, or making them yourself with Generantis' open asset development! Once you created the planets you want, you can move to the third phase: Legend Runs and endgame. Legend runs are just like adventures, except you repeat them in order to create stronger and stronger Legendary items. The legendary item was an idea planned for Generantis long ago, but now I feel I can finally share with you what I've nearly finalized on for the design of what makes a legendary a true legendary. Unlike normal legendaries from diablo-like dungeon crawls, these legendaries are created by you. When completing an adventure, you are rewarded by immortalizing both you and an item you found on the way. For example, let's say I found a map called "Dungeon Desert" that I really like, one with dungeons and a mini boss in them, but unlike other ones I found, it also had outposts with friendly players hanging around it that can join my army. So I called it "Armies of the Oasis" Dungeon Desert. In order to reward adventuring players, legendaries drop more often on adventures, so to improve my legendary, I adventure again with a new character in order to find more legendaries. When you find a new copy of that legendary, it will have slightly better or worse stats and an extra component called a glitch component. Unlike other components, glitch components can be any component at all from any of the other items of that item category. So this means a glitched sword could shoot like a shotgun with recoil! Once you find the same legendary again, you can make that legendary a legendary. This is called "Legendary Recursion" and rewards the player for doing this by having a chance for the main stats to roll even higher than possible before. Also, by doing this you upgrade the legendary, because the next time you find it, it will have yet another glitch component on it. This can go up to about (13?) components on one item, and with the max components on a regular item being changed to 3 in the future, finding legendaries will be a necessary experience but also a very customizable and rewarding one. As for the endgame, it's a long trek into the unknown as you continually make more and more planets deeper into the Gigaverse, with each planet giving a small amount of new items (this is going to get changed to about 3 new items per planet at most) changing the pace of the game to involve very long branches to get to the very deep items in the tree. Also, to help manipulate RNG, upgrades to items towards deeper items in the tree will be easier to unlock the more of that itemtype there is in the planet, but also with only a few of them the chances will be nerfed. I'd say with only 1 item in the tree the chance is about 1:200 of that item, but with 10 of those items you reach the cap of 1:2 of the items. And there you have it, it's a lot of text near the end because of how in depth it got, but I think I really wanted to explain as much as I can so you get a better idea of what I'm planning for the game. I've decided to upload the build as it is currently, the game should be fully stable, and has plenty of the features planned for November. It also has edited launch options for the jar file, so that it should be able to launch on just about any computer with decent RAM. Check out the build on the itch.io page! The website has been updated with some interesting content recently, check it out! Also, a video has been uploaded, showing some current gameplay from November's build. Check it out on the media page. Balanced some numbers, mostly with the spawnrate of bomb blocks to avoid having them spawn too much (this is mostly due to the fact there's only 2 scripts to choose from for the wings, and the bomb block one stacks often...) As well as trying to get damage to not be so weak at first. New items: Half souls (for converting minions), Ninja Wizard (Teleports next to enemies near cursor with jump button and does an attack), And trickster gloves (name wip) that catches airborne projectiles for a random buff. New scripts: explode minion on the potions, several others for the new items. Scripting now has a new coding trick: typing a carrot between lines of code on the same line will now parse as multiple lines of code, all chosen randomly each time the script executes. For example, typing ^ele="+Strength"^ele="+Dexterity"^ele="+Vitality" will choose to either make the variable ele equal to either +Strength, +Dexterity, or +Vitality, so that it can be used to give a random buff! Hello, over the past weekend I've been working on Generantis in my freetime, and greatly improved the terrain generation in each planet. I haven't touched the terrain code in a while because of other priorities, but now that I've begun working harder on code for the map item, I can share what has changed with you. Previously, the terrain generation was very basic and nowhere close to where I wanted it, it was only a bunch of island blobs that go on for miles into infinity. I was experimenting with hardening the generation of the planet's foundation in order to create a massive surface to the planet. Sky islands still show up in the sky, but now there is no sky below the surface of the planet. The ground below your character is all blocks that are either spawned as one of the 3 selected blocks for that planet's biome, blended around with perlin noise, and caverns that sprawl around, all relying on noise. Each planet has a slightly higher or lower density of caves and caverns, some with very massive open spaces, and others with the occasional bubble of air underground, as well as the sweetspot in the middle where caves naturally spawn. There are only blocks that spawn underground, no air blocks, so when you explore caves the open spaces are dug out blocks with backgrounds, as can be seen below. 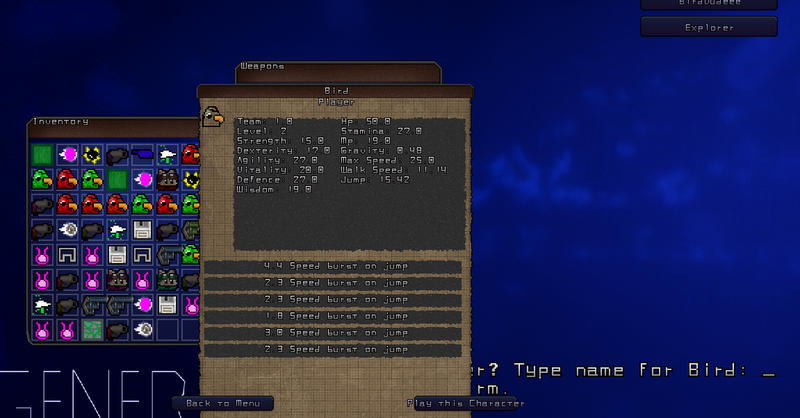 Also, the spawnrate of monsters and quests increases as you go deeper, for some interesting planet endgame ideas. The same goes for when you explore higher up in the planet, in the outer reaches of the sky islands. Also, the character saving system has been finally added! The default character you start with (although characters will probably be premade in the vanilla version) is "Explorer." When playing with a character, you play as you normally do, then as you leave a planet, it saves your progress. Any player items you were holding in your inventory can be selected at the character select menu in order to have the game prompt for a new character. The player items in Generantis can be used to make new characters that you can name and play on. That's all for now, stay tuned for more updates! The current form of the site is still under construction, but you're free to look around and see the little content currently posted on this site. Enjoy! I'm Ian, also known as ChromeWing, and I made Generantis, an indie game that features a procedural shooter with user designed items, currently in development.